The Caribou had to fill big shoes when it was introduced in 1961. It's older, but smaller brothers, the Beaver and Otter were already legends. The Korean War had ended in a stalemate but America was soon again involved in another conflict, the Vietnamese War. The Caribou was de Havilland Canada's third STOL (Short Take Off and Landing) design and the first to be powered by two engines. Unlike the Beaver and Otter it was aimed at the military market as a medium tactical STOL transporter, ideally suited for short and unprepared airstrips. 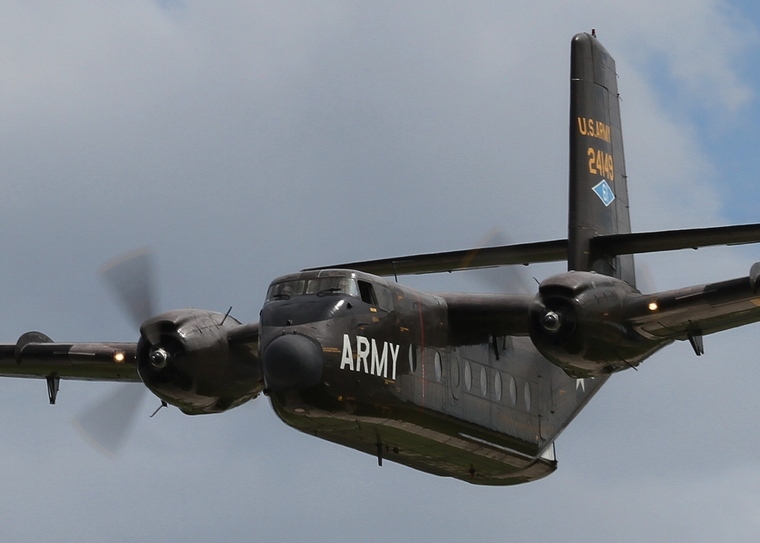 The Caribou was designed to meet a US Army requirement for a tactical airlifter able to land and take off on short unprepared strips and to supply the battlefront with troops and supplies and evacuating casualties on the return leg. Designated the DHC-4 the prototype first flew on 30 July 1958. The US Army was suitably impressed and ordered five for evaluation and although production was destined for military operators the types STOL capabilities soon drew the interest of some commercial users one of which was Air America. The origins of Air America dates back to WWII and General Claire Lee Chennault who with support from the US Government started a volunteer group of pilots, the famous 'Flying Tigers', to assists the Chinese nationalist in their fight against the communist. Chennault purchased a number of surplus military aircraft and created the Civil Air Transport (CAT). These aircraft were later used in supply missions to the French Forces and others throughout the mid to late fifties until it was purchased by the CIA through a holding company the American Airdale Corporation. Under this agreement, CAT was allowed to keep its initials and the company was reorganized as Civil Air Transport, Inc. The main function of the “Airline” was to support US covert operations prior to and during the Vietnam War. Air America's slogan was "Anything, Anywhere, Anytime, Professionally". It operated from bases in Thailand, Taiwan and Japan and its fleet of de Havilland Canada DHC-4 Caribous, Fairchild C-123 Providers and Curtis C-46 Commandos flew cargo, civilians, diplomats, spies, refugees, commandos, sabotage teams, doctors, war casualties, drug enforcement officers, drugs as well as search and rescue missions for U.S. pilots downed throughout Southeast Asia. It even transported visiting VIPs like then USA President Richard Nixon. In 1961 De Havilland delivered the first 22 out of a total of 159 C-7s to the Army. The Caribou soon found its niche in Vietnam where its STOL capabilities made it the ideal aircraft for the insertion of troops and supplies onto short and unprepared fields at isolated outposts where its larger compatriots the C130 Hercules and C-123 Fairchild Provider could not land. The C-7 could carry 24 fully equipped Para troops, 14 littler patients, three tons of equipment or two jeeps and its rear loading ramp made for quick loading or off-loading drastically reducing the time spend in often precarious conditions. Beside the US and Australia, where the last Caribou was only withdrawn from service in 1999, de Havilland's first twin military transporter found its way into Africa were two were bought in 1971 by the Cameroonian Air Force whilst eight were purchased in 1963 by the Air Force of Ghana. The Kenyan Air Force operated the type from 1966 to 1987 and Liberia two until 1989. Caribous also served in the Tanzanian and Ugandan Air Forces. Some U.S. Caribou were captured by North Vietnamese forces and remained in service with that country through to the late 1970s. 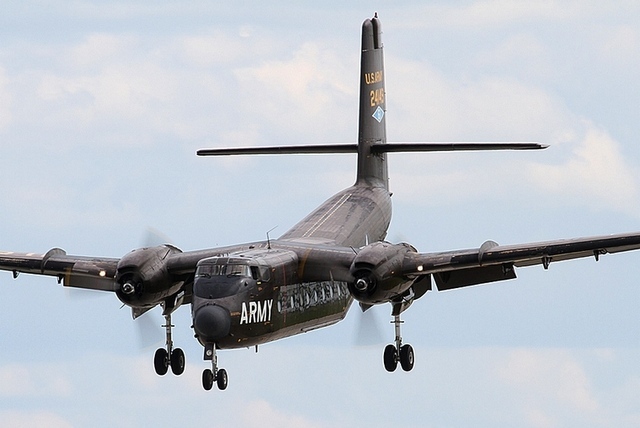 The Caribou found favour with other Air Forces as well and was operated by the Air Forces of Spain, Canada, Malaysia, India and Brazil where the Vietnam War veteran was replaced by the CASA C-295 turboprop. Following the war in Vietnam, all USAF Caribous were transferred to Air Force Reserve and Air National Guard airlift units where they served until the 1980's when they were replaced by the C-130 Hercules.